Examine the dynamic nature of vascular responses and brain perfusion. 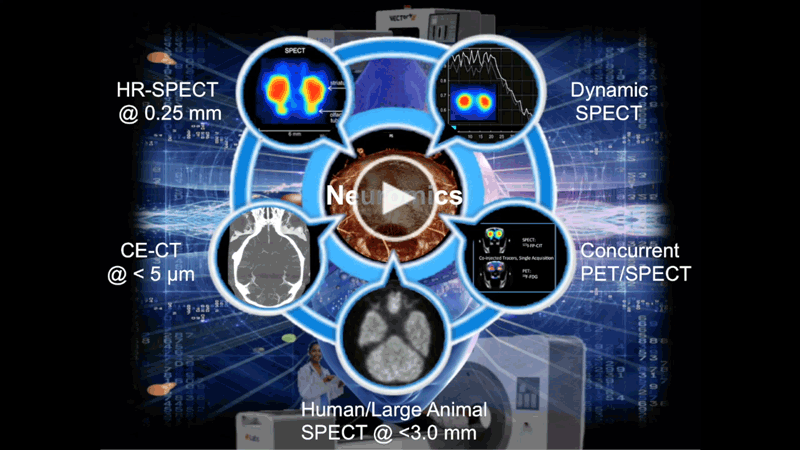 Study neuroreceptor kinetics at ultra-high resolution with SPECT in species ranging from mice to large non-human primates. Gain new insights into brain (dys)functions by simultaneously performing spatially and temporally co-registered PET and SPECT acquisitions. Probe neurodegeneration with in vivo bioluminescence and fluorescence imaging. Replace labor-intensive and error-prone neural tissue examinations by automated 3D multi-tracer autoradiography. Perform SPECT/CT and PET/CT at ultra-high resolutions critical for studying structures that fall well below the threshold of other preclinical hybrid scanners. 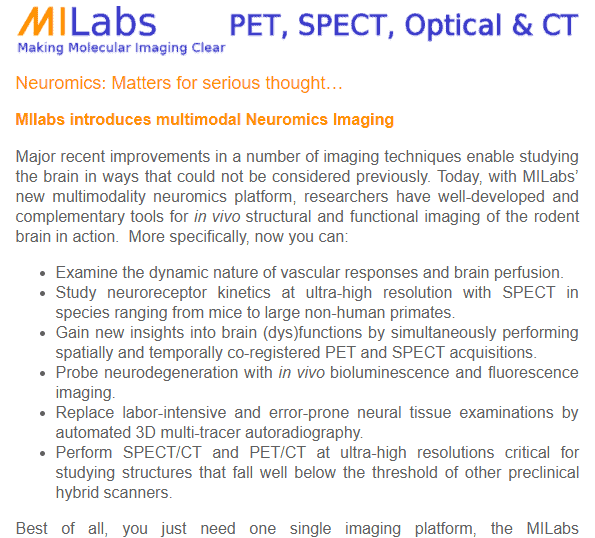 Best of all, you just need one single imaging platform, the MILabs PET/SPECT/OI/CT (VECTor-OI/CT) system, to make this all possible. MILabs’ VECTor-OI/CT system makes anatomical, functional and molecular neuromics evaluation possible in a completely non-invasive way.